We'd (Basil included) really built this moment up in our heads, doing lots of online research to ensure we'd end up with "bags full of potatoes" in the fall season — which is finally here. Can anyone else believe it's actually November already? For those following along, we'd been waiting to see signs of purple flowers or yellowing leaves as a clue for when to harvest them from the bags. We'd also heard it was good to go ahead and get them out of the ground before the first frost. 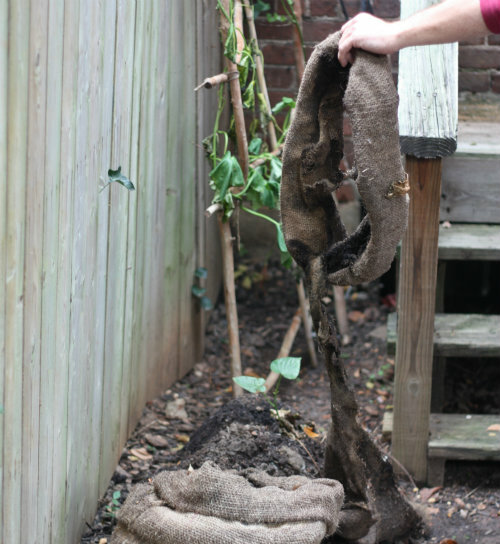 We decided now was a good time to go ahead and find out what had been growing in those coffee sacks over the past 5 months. 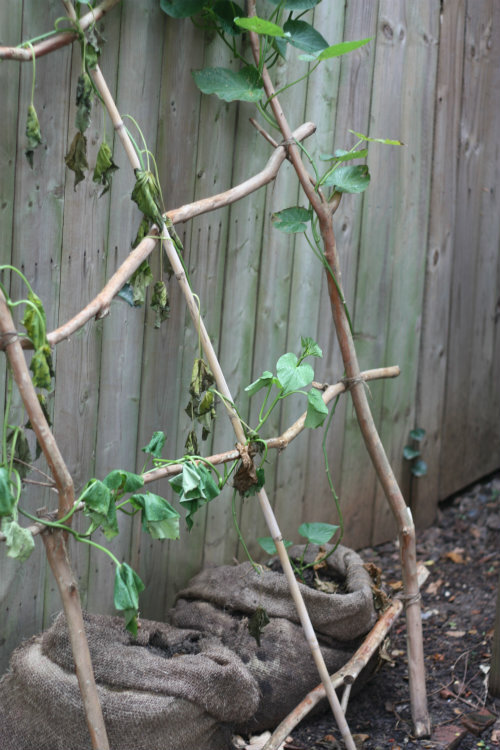 To get things started I snipped the vines from where they were growing out of the soil and set the support structure we built to the side. Then I went to flip the coffee sack over, thinking I would be able to just dump all the potatoes out when the entire bag just ripped apart as I grabbed it. We chalked this up to just being left out in the open exposed to all the elements for an extended period. I started digging around furiously trying to find all the rest of the potatoes. Tell us we're wrong, tell us there's more, we were thinking and laughing at the same time. They are basically like huge sweet potato fingers. We are saving them to make something with — even if it's just 4 lone sweet potato fries. haha. So that's what we have to show for all these months worth of trying to grow sweet potatoes in bags and all the blog posts we laid out showing how to do so. We contemplated going back and editing all those posts to say something like "how to grow sweet potato fingers." We're not quite sure what went wrong. Maybe we started too late, maybe we harvested too early. Maybe bags aren't quite as conducive to growing potatoes as we hoped. Maybe we over-watered, maybe we under-watered. We definitely didn't add any growth chemicals or fertilizers. But you know what? We want to try again next year. We're taking this on as a challenge, and yes, we are crazy. Sorry for the let-down guys! Have any of you had luck growing sweet potatoes? We'd love any tips for hopping back on the bandwagon as soon as spring rolls back around! 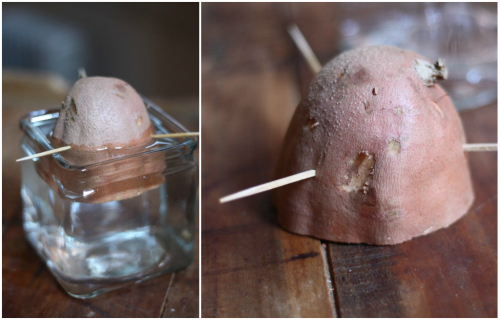 Catch up on our full sweet potato growing experiment here. Haha! I feel for you guys! This is funny and tragic at the same time. Best of luck for 2013! Thanks Willow — your email encouraged to try again next year! 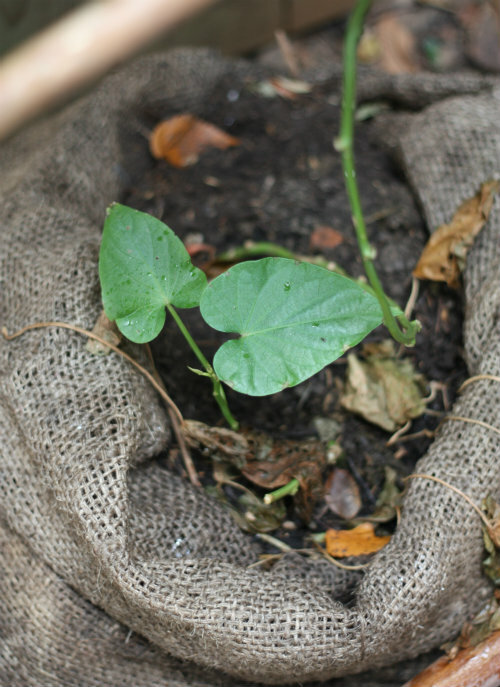 I am so sorry about your sweet potato fingers but I suppose there is hope and though the burlap bags were cute and all, growing in the ground seems best. Function wins out over fashion!! Absolutely Rowan! We are brainstorming tweaks for next go round already! No let down here! I loved following you progress. I was actually impressed with your 4 fingers and still consider it a reward for your hard work. Great job. I look forward to following you during the next growing season. Best Wishes. You help give us motivation to try again! I have been growing sweet potatoes in a large rubbermaid container in our back yard. I saw the flower - yep, just one - about 3 weeks ago, so I went in delicately to see. I pulled up 3 small potatoes and then decided to give it a little more time. I hope to try again this weekend. Fingers crossed! I did totally eat the 3 small ones and they were very good. Sounds like the flower is the trick! We didn't wait long enough or something went wrong, haha. Let us know how yours turn out!! You're probably better off getting actual seed potatoes. Even though you had an organic potato to start with, it might not have been capable of actually producing anything! Great idea — maybe we could put them head to head next year! although potatoes are usually grown from seed potatoes. Sweet potatoes are only grown from slips. We grew them last year at the csa where I volunteer. Planted about 1200 slips- yikes. How did the purple potatoes do using the slip method? You actually inspired me to plant some.. But I just used the slips that sprouted from sweet potatoes in my pantry (just ripped them off and stuck them in the dirt) my sister also bought some rooted sips and we planted them all together... We got a TON! Some bigger than my calves..
We planted in the ground in a VERY sunny location with news paper and hay around the plants. We also live in South Mississippi. Maybe that will give you some ideas to try next time? From what I understand.. They LOVE sun. Wow!!! So we know now it CAN be a success! We are determined to try again! I'm thinking because the soil is loose in the bag, the plant just continues to shoot forward producing a long lean "carrot." 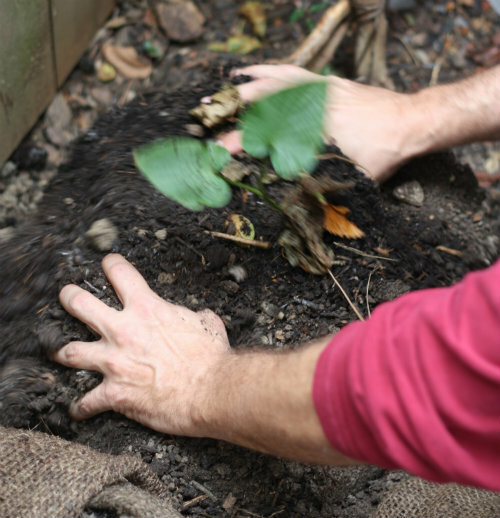 In the soil - it's much tighter and the tuber "backs-up" and produces the thicker version. Barb we think that is a great assessment! We are going to find an area (somewhere) to plant them in the ground next year! Maybe a raised box! You can eat sweet potato greens even if the roots don't quite show up. Sweet potato greens are popular throughout Asia, stir fried with onions or shrimp paste or simply tossed into soups. They're more tender than spinach. I just discovered your site today, and already I've cut up my celery. :) I'd forgotten about the sweet potato greens till now, and I'm super excited because I'm going to grow them for summer greens. Spinach can't use up my vertical space efficiently and wilts in the heat. Wondering how the purple potatoes did? My slips are close to being ready to plant. Think i will try some in ground & maybe in plastic storage boxes. Just an fyi, once I took the slips off I placed them in an ice cube tray. Each slip has its own compartment, so roots can't tangle. Fits on window sill better too. 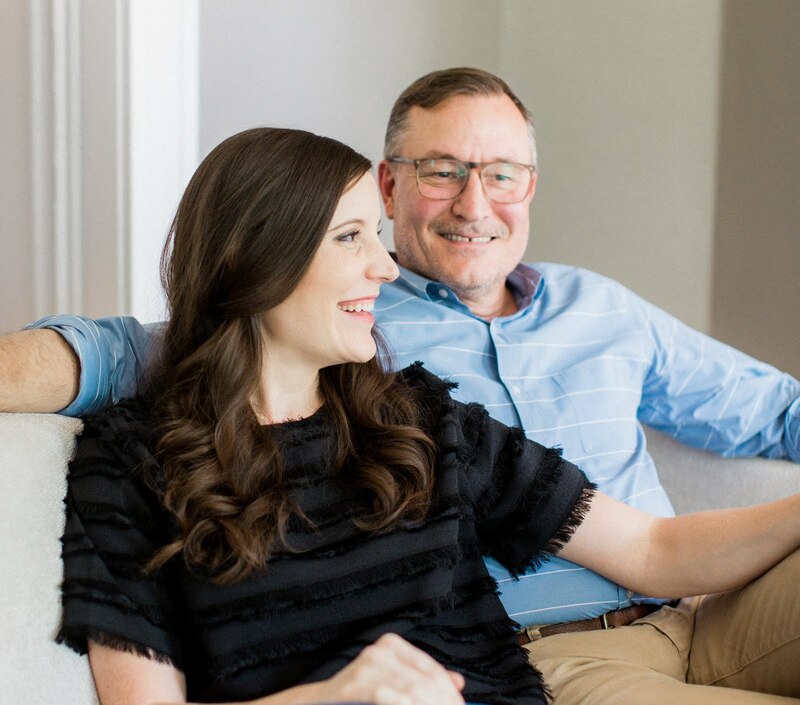 Just stumbled upon your blog and I'm lovin' it! So many kitchen scrap gardening ideas I have to try now. It's a couple of years after your sweet potato experiment but it you ever decide to try again here are some helpful tools to keep in mind. 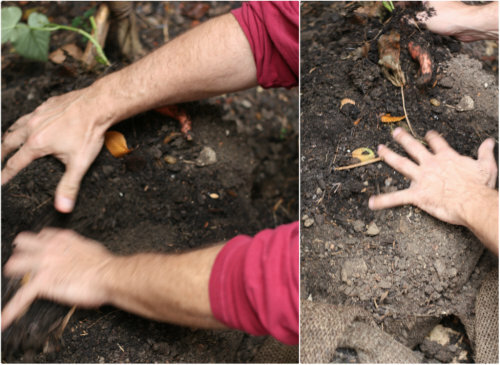 1- Too much nitrogen in the soil causes long, thin roots. 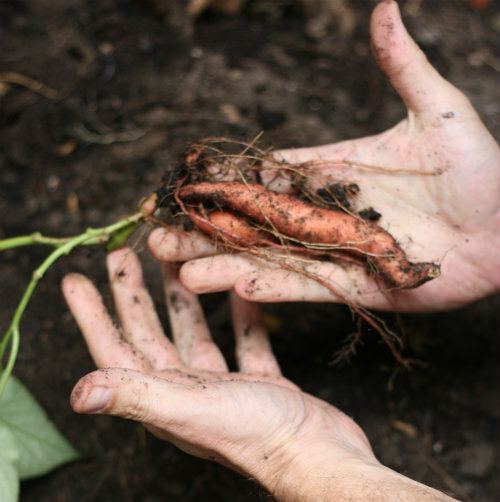 When planting next season, don’t improve soil in your sweet potato patch with anything that might add nitrogen (such as compost), and don’t fertilize (most fertilizers are full of nitrogen). 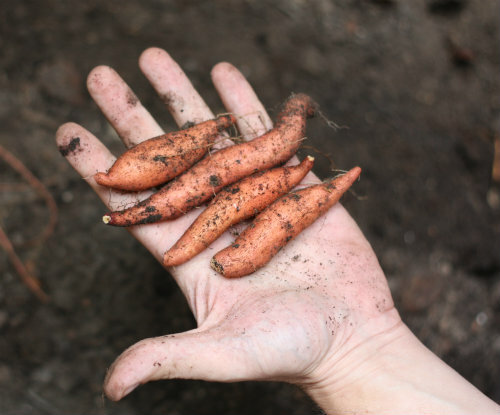 2- The best soil for sweet potatoes is a light, sandy soil. It should be slightly acidic, and have a good supply of phosphorus and potassium. 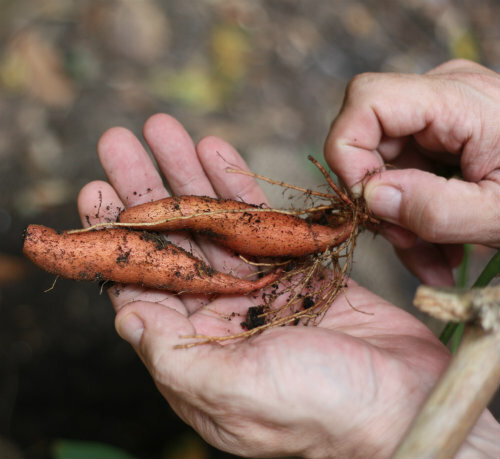 3- It is time to dig up your sweet potatoes when the foliage turns yellow and dies OR when the frost cuts it down. DO NOT allow your roots to freeze in the ground. Hope you try growing them again! 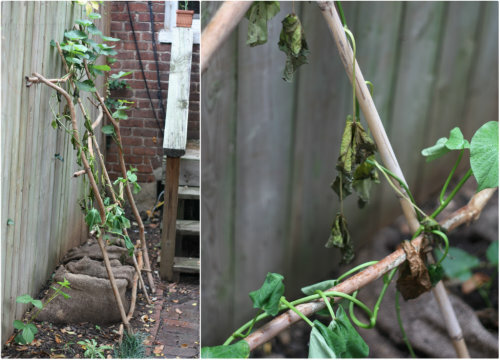 Hi, have you pruned your sweet potatoes on this post? I've read that pruning the plant will cause it to grow even more instead relatively affecting the size of the tubers. I've been reading all your past posts about basil, mint and this! Hehe.